Ok, so we don't all have the same experience doing reviews of movies or restaurants or anything else and based on the photos below I'll be the first to admit that I'm lacking in experience in this matter. This is probably the first time I'm posting about food that wasn't eaten at the all-you-can-eat Chinese buffet, which I discovered last week as decided to close on Mondays which left me very disappointed. Buy I digress. Today being Valentine's Day Donna and I decided to hit the Midtown Grill in Delhi, a local establishment that I have been wanting to try for quite some time. We arrived for lunch at around 2 pm and the place was empty. Not a surprise at that hour. Dinner started at four today although they don't usually serve dinner on Tuesday, but today is an exception. So anyway, The server, who is probably related to the chef brought the lunch menu and returned for our order before we had decided. We ended up each ordering the entree pictured below and we never did get to try the starters that we were still contemplating when our order was taken. We'll probably go back next month for my birthday... but I digress again. The plates arrived and the food was delicious. 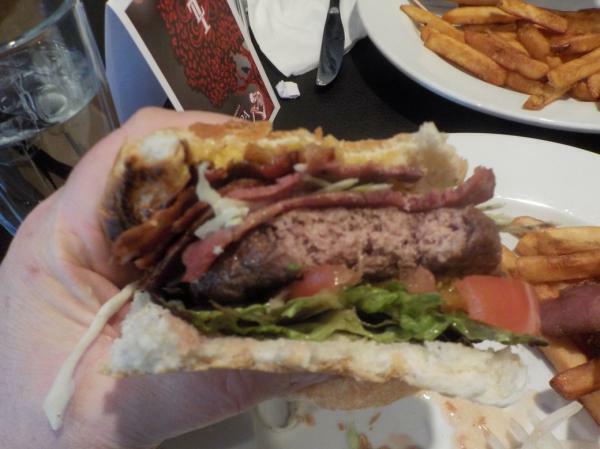 You can see the size of the burger itself and also in the roll along with lettuce and tomato was pastrami and bacon--the porky burger--house signature dish. 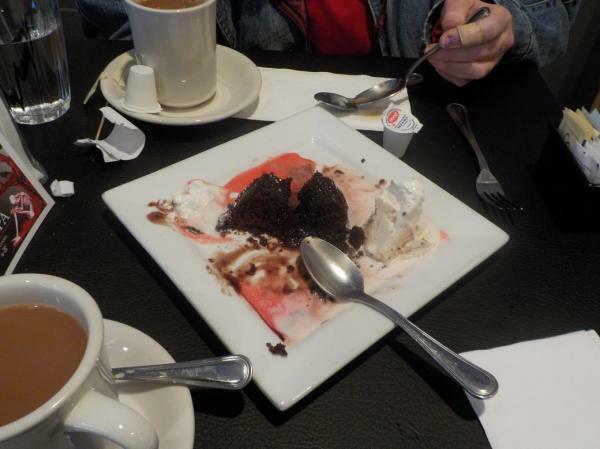 We did opt for dessert and coffee but as you can see, I forget to take the camera out in time so we half-devoured the volcano cake which we shared and which was also delicious. We don't have groupons or anything like that around here so lunch came in at just under $40 which is on the high side. But the reason I say well go back next month is because the staff and chef are eager to please. The business and the chef each have a facebook page and the chef is happy to do special orders. So if I want lamb for my birthday, all I have to do is send him a pm on fb a few days before and I'll have what I want. So considering that we don't dine out often, it was a fun time. And with the help of some of Donna's fries, I didn't leave hungry. Ok, Martin, I'll know you'll critique this even if I don't ask, so I'll ask first. How'd I do. Oh, I just realized that I forgot to describe volcano cake. It was a perfectly cooked chocolate cake with no little round hard ring on the bottom filled with some kind of hot liquid chocolate that I forgot the name of. French vanilla ice cream on the side and whipped cream also on the sides. What else? The restaurant sounds like a keeper. I have a meal like that once a year, though. Maybe we'll try it again at a better hour. Any place that might serve lamb, even if they didn't have it all the time, would be one of my favorites. Hopefully we'll try it again for Ester when lamb will be on the menu. I'm not sure about pastrami, but I could really go for a burger with kosher corned beef on it. That food all looks good. 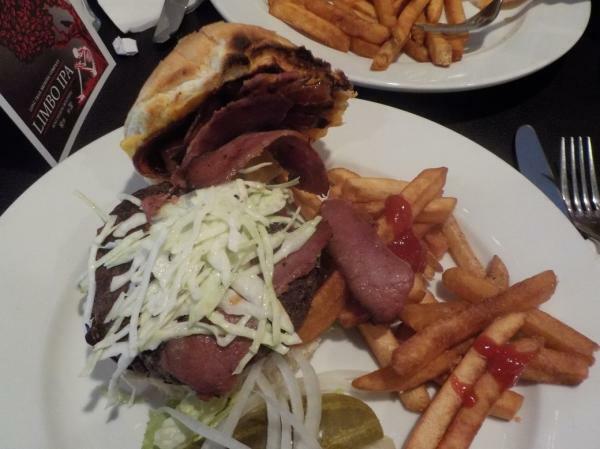 You could see the pastrami and bacon but it wasn't loaded to the point where it overpowered the burger. Obviously lunch is not a regular thing with them so it went pretty good. I read one of the reviews--prime ribs would be my dinner choice!! Lunch is what they do most. They made an exception for doing dinner yesterday and that's probably where they expected the crowd since they were posting specials on fb. I looked at the dinner menu but I can't remember if prime rib is a regular item or a special. I know it was a special a few Saturdays ago. I don't take a chance on medium-rare if I don't know what to expect so I go with medium to be safe and it was still juicy. The bacon and pastrami was the reason I ended up with a burger. As Jeri mentions above, I also prefer to order items I don't make at home. Surprisingly the lunch menu was rather mundane. Donna had considered the Ruben but changed her mind for some reason. I'll go to yelp before I comment to Jeri so I don't forget. I've heard of the site but have never been there. in my family love it. It was my intention to have lamb at dinner (which they wouldn't have had) but then we ended up going for lunch. The lunch menu wasn't exactly exciting. I didn't want a wrap and I didn't want mexican, so I ended up with the burger. I'll make your earthquake cake if it doesn't take too many odd ingredients that I don't have around. I need more interesting desserts. It's been marked-down donuts from Price Chopper for quite some time.
" I forget to take the camera out in time " That's a problem I have==especially when it comes to dessert!! 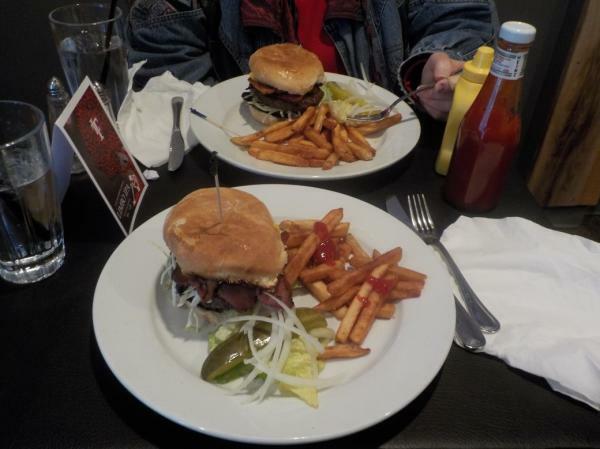 The burger really looks good (though too well done for me) and I never thought of pastrami on a burger though it's a good idea but the fries look like the frozen ones--all in all I would go back. Yelp review is also posted. Link above. Good suggestion! Ah crap, your reply is above Jeri's comment.